Winners of the 2018 Crystal Growing Competition received prizes and accolades at the awards ceremony in May. Photo by Tatum Lyles Flick. 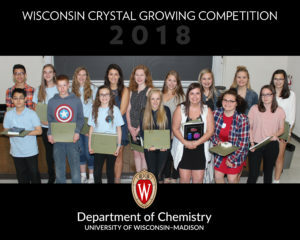 May 18, 2018, Madison, WI — Each year, students across Wisconsin compete to grow the largest, highest-quality crystal or to produce innovative crystal-inspired art in the Wisconsin Crystal Growing Competition. This year marks the fifth year of the contest, and the second year students could win a chance to work with the Center for the Advancement of Science in Space (CASIS), the sole manager of the International Space Station U.S. National Laboratory, to send crystals into space for further experimentation. Event organizers announced six student space contest winners and 12 others who placed in the competition, at the May 18 awards ceremony. Students who won the chance to collaborate with CASIS and their Space Station Explorers (SSE) education program in early 2019 include: Joseph Quinn of Whitefish Bay; Kaitlyn Twesme of Lake Mills; Payton Kelly-Van Domelen of Sun Prairie; Kristin Kiley of Madison; Star Frasier of Manawa, and Kaela Greenfield of Hartford. Student winners at all levels receive science and chemistry books, monetary prizes from the American Chemical Society WI Local Section, and certificates. The free competition, hosted by the University of Wisconsin-Madison Department of Chemistry Molecular Structure Laboratory, offers two age-based categories, 11-13 and 14-18. Students register for the competition each February, chemical supplies arrive in March, and they have until the end of April to complete and submit the assignment. All participants are invited to attend an award ceremony each May, which includes department tours and an array of science demonstrations and a presentation about the International Space Station by CASIS senior research scientist, Dr. Marc Giulianotti. This year, 209 middle school teams and 169 high school teams competed, with more than 655 total participants. Judges choose winners in three categories: best overall crystal, best quality crystal, and best crystal-related art. They review crystals for quality without assessing mass and for quality and mass. A crystal of the highest quality has the recognized crystal shape and symmetry of that chemical. Artwork entered into the competition can use any medium including photography, poetry, multimedia, paint, or even clothing design. The contest introduces students to the scientific method, expands their vocabularies, and teaches them safe laboratory practices, about solution chemistry, to work in teams, to keep a lab journal, and to learn to fail and analyze, then grow from that failure. They also learn to use chemistry reference books to find out about the substances they use to start seed crystals. In addition, space project winners learn to communicate science to the public through poster presentations, talks, blogs, social media activities, and interactions with the media. 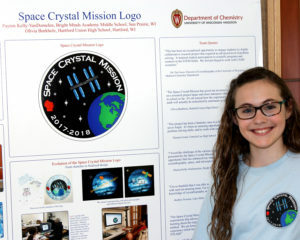 Payton Kelly-VanDomelen, winner of the 2017 space crystal contest, presents her poster at the 2018 awards ceremony. Photo by Tatum Lyles Flick. Current event sponsors include: The American Chemical Society WI Local Section, The American Crystallographic Association, Bruker, The Cambridge Crystallographic Date Centre, The Evjue Foundation, The University of Wisconsin-Madison Department of Chemistry, Hestia Labs, The Institute for Chemical Education, Leica Microsystems, Rigaku Oxford Diffraction, Sigma-Aldrich, CASIS Space Station Explorers, and ZEISS. The crystals from last year’s winners recently returned from space. Dr. Guzei will have them analyzed to see how their growth in space compares to their growth on earth, and will share that new knowledge with students. Conditions on the International Space Station affect the normal processes by which compounds crystallize, generally higher quality crystals. Currently, scientists study these processes on the International Space Station to learn more about the materials and to identify possible new drug creation methods. The University of Wisconsin-Madison Department of Chemistry conducts world class, groundbreaking research in the chemical sciences while offering the highest quality of education to undergraduate students, graduate students, and postdoctoral associates. To receive all news releases from the University of Wisconsin–Madison Department of Chemistry, email your contact information and request to connect@chem.wisc.edu.